Our personalised hi-vis jacket-wearing bears are a perfect giveaway item for promoting your road safety brand or campaign, they are also idea for cycling and running brands. A personalised hi-vis bear can't be beaten when it comes to visibility for your message, all eyes will be on these cute little branded bears. 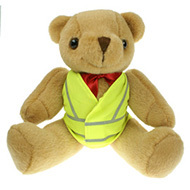 Check out our large 25cm printed Honey Jointed bear with hi-vis, this branded bear is perfect to personalise with your organisations brand, logo or message for maximum cuteness and awareness. We are able to provide visuals with your branding and put together a full promotional package for you. so contact our friendly team today at sales@allwag.co.uk, Call us on 01245 382600 or chat live with us above.